Friendly little reminder to change out your plastic coolant tank pressure cap if you haven't done it within the last two years. They only last about two years and then will cause your car to dump coolant out of the cooling system. I know, this happened to me about two summers ago and I caught it going bad this time about a month ago by watching my temperature gage go higher than normal readings. Changed it out and everything is back to normal. The cap is only around $20. what do you mean by "temperature gage go higher"? mine stay in between "8" and "0" on highway, local traffic it's in the middle of "0"
Mine stays steady between "8" and "0" generally in traffic too. Just change it out if in doubt. The Porsche part number is: 996.106.447.01. If you have a cap with part number (on the top of the cap) 996.106.447.00 you need to replace it with the .01 cap. Most, if not all, of the 00 caps leak. US MSRP is $17.45 (as of June 2007). I'll jump this bandwagon Thanks for the tip. I have had my 99 for 4 years and I have not replaced it. It'll be nice to know if I have the old one too. While replacing the expansion tank cap is important if you have the older "00" cap, the real culprit in a car running hot is the radiators being clogged with road debris. I recommend every 2-3 years that you take the front bumper cover off and clean off the radiators. You would be amazed at the stuff that gets lodged in there. Just reaching in and getting the debris out is not enough. The issue is that stuff gets clogged between the air conditioner condenser and the engine radiator. This reduces the airflow through both parts and makes the car run hotter. Here are some pictures from a recent radiator cleaning of my neighbors 99 996. One last thing, make sure that the expansion tank cap is fully closed. The issue is that the gasket inside the cap binds on the tank neck. Be sure to spray a little silicone lubricant or soapy water into the top of the cap so that it turns that last 5% of the way. Isn't that picture of the blue cap the older version that was replaced by the "01" that's black? Also, I read somewhere that in addition to cleaning off the debris that collects on the front radiators, that you also have to clean behind them...that there's another A/C evaporator or some such device behind and that debris also gets trapped in there? Loren? I have seen both blue and black .01 versions of the coolant tank cap. As long as it says .01 it should be okay. 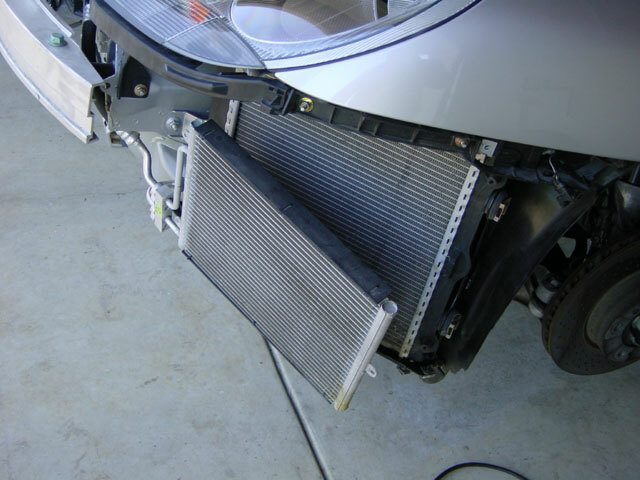 Yes, on US cars this an AC evaporator front of each radiator. 1. yes the first picture is an "00" cap, and the bottom one is an "01" cap. 2. Yes as a matter of course you clean both sides of both radiators on both sides. The front radiator is the air conditioner condenser, and the back one is the engine coolant radiator. There are 2 sets of these, one on each side. Some cars have a 3rd radiator in the center of the front of the car as well. You must pull apart the 2 radiators to get the gunk that accumulates between them. There is not so much stuff that sticks to the back of the coolant radiator because it all gets blown out (sucked out by the fans too) through the air exhaust duct. This picture shows the air conditioner condenser and the coolant radiator pulled apart. That last picture posted by Orient....is that the radiator that's actually BEHIND the AC evaporator? That gunk is what was sandwiched BETWEEN the radiator and the AC evaporator? Or is that just what's on the front of the radiator? I've been routinely cleaning off the radiator (or is it the evaporator) that you can see if you shine a flashlight into the front cirbers of the grill...and am using a vacuum with a long narrow fixture to clean it all out.....but are you saying that behind what I can see in there is potentially another accumulation of crud sandwiched in between the radiator and the evaporator? Then the only way to clean this would be taking off the front bumper and getting between the two? All this time I thought that keeping the area clean that you can see back in the corners was all there was to it. Yes, that is the water radiator - Gary (Orient Express) has moved the AC condenser out of the way. The condenser and the radiator don't match up - so there is a gap at the bottom where stuff can get in behind the condenser. 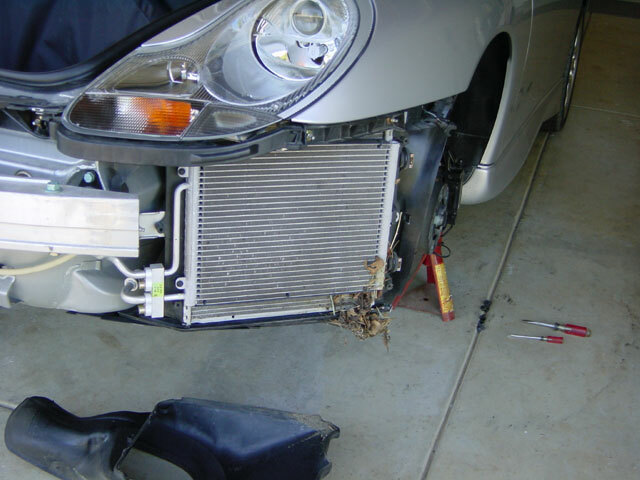 Yes, as Gary suggests removing the bumper, the air ducts and cleaning the condenser and radiator behind every couple of years is highly recommended. Yes, the majority of the gunk is between the evaporator and the radiator. There will be debris on the front of the evaporator too, but most of it is between the 2. I was having a similar problem with the temp gauge moving up to the middle of the 0 in 180 in city driving. I double-checked the cap and made sure the fans were working. Then today, I decided to finally take the bumper cover off an clean the radiators. Wow, there was so much junk in there, I couldn't believe it. Vacumed it out, put everthing back together and I'm back to rock solid straight up right between the 8 and the 0. I did find that much of the plastic peices on the bottom behind the radiators was gone or broken to the point of not being of any value. Next weekend project is to replace all that stuff. thanks all, i have noticed that my temp guage has been moving into the middle of the "0." i just check my cap and its the old one, i have just order me a new cap! Thanks for the heads up! IS this new cap only for MK1 996s?? I have an 02 996 with a "new" engine replaced on 2004..
Yeah, about the cap-be proactive and buy one before you need it. Maybe even a spare. I too learned the hard way. It was a Friday and I was leaving Orlando to go to Atlanta for the weekend and sure enough coolant poured by the right rear wheel. I found this awesome forum by the way while looking for what may have caused it. Yep, old radiator cap. Called the local Porsche dealership, told them I needed the cap and some coolant. They were closing Parts soon so they charged my card -they said they didn't know how much it would be-and had it waiting for me at the receptionist area. Well my bill for part # 996.106.447.01 was $28.00 and the coolant was $68.50! Perhaps that's list price but it seems high and I can't believe that an experienced parts guy wouldn't have a pretty good idea of cost on maintenence parts. Needless to say I haven't bought from them again nor serviced my car their either. Since then I've done a 60K, front and rear brakes, cleared the a/c line, and a battery. They lost around $1500 so far because the parts guy wanted to rip me off for an extra $30. Oh well. Anyhow for $18.00 bucks buying a new cap just might make your life easier by saving money and more importantly time. A MY02 should have the newer cap. Turns out some of the black caps don't show a part number (as we found out today). For a MY03 996, would you still replace the cap every couple of years (even if it came with the newer version)? A MY03 should have the new cap. You don't need to replace it unless it is leaking. I read the post on the front bumper removal on http://www.realtime.net/~rentner/Blog/B600...4135/index.html , but how were you able to take off your bumper without taking off the front tires? Are the wheel well "plastic nuts" that easy to reach around the tires? I want to work on this over the 4th of July holiday, but I've got some jack adapters on order and they won't get here by then. If I can avoid taking off the tires, I'll give it a shot. Thanks! Loren and I did this same thing today...took off the front bumper and cleaned out the area between the radiators and the condenser....I had been vacuuming the front of the condenser and thought that everything was clean in there. I was really surprised when Loren took off the bumber and I saw all the crud sandwiched in between the them. We didn't have to take off the wheels, but there are quite a few phillips screws in a number of hard to see locations that you have to take off. I would have missed a few of them, but Loren knew where they all were. While we had the front bumper off, we also took out the factory horns and installed the "Italian Super Loud Air Horns" that Griot's sells. The are as advertised....Loud! Plust they have that two tone "Euro sound"....however you choose to describe that particular two-tone sound. The horns are rated at about 137db....and only cost $39.95....pretty good deal really. They do get folks' attention.